Meet these movers and shakers who infuse the legal profession with a dose of creative thinking. Some say the legal profession has changed more in the past 15 years than the preceding 50 years, driven by technology, economics, and changing client expectations and demands, says Tom Watson, chair of the Innovation Subcommittee of the State Bar’s Communications Committee. “We hope these innovations can help lead to a future where lawyers thrive in an ever-changing and highly competitive legal marketplace,” he says. Wisconsin’s legal innovators are tackling those challenges and others, such as the need to address diversity in both the profession and client population, the desire for more efficient technological solutions to forge professional connections, and the unmet demand for legal services among populations ranging from low-income people, to the LGBT community, to fledgling business startups. 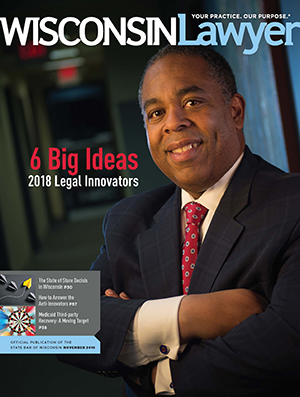 Five of the six innovators selected for the State Bar of Wisconsin’s fifth annual “That’s a Fine Idea: Legal Innovation Wisconsin” initiative did their work in either pro bono or reduced-cost services, or diversity and inclusion, Watson notes. This year we honor six individual or team innovators, including a lifetime award winner. Diversity in the legal profession is a challenge that might never be solved outright, but Milwaukee attorney Emery K. Harlan, a partner with MWH Law Group LLP, is clearly one of those helping to bend the arc of history in a more inclusive direction. During the past couple years at MWH and for many years before that at his previous firm, Gonzalez, Saggio & Harlan, Harlan worked to hire and promote minority and female attorneys, helping them to develop relationships with key decision-makers at corporate clients, as well as encouraging those decision-makers to consider them as a resource. net edfinkel earthlink Ed Finkel is an Evanston-based freelance writer. Harlan’s current firm – which was formed by former Gonzalez attorneys and handles general business, litigation, public finance, intellectual property, and technology law – has 16 attorneys, including eight African Americans, one Hispanic, and 10 women. The equity partners are Harlan and Kerrie Murphy. But Harlan says many larger firms have only a handful of people of color, with predominantly white, male executive and compensation committees. Know a legal innovator? Are you one? Tell us about the people and ideas that are changing Wisconsin’s legal landscape. Nominations for 2019 open April 1 and close on June 30. An internship at the Transgender Law Center in California during her first year of law school gave Abby Churchill a window into the unique legal needs of transgender people. This experience, along with having “many friends and loved ones who identify as transgender,” built a passion that she brought back to Madison in founding Trans Law Help Wisconsin. “I have both personal and professional connections to this work,” she says. Transgender people face a multifaceted set of legal challenges based partly on the societal misconceptions about what it means to be transgender as well as the systemic marginalization of the community across many socioeconomic factors, says Churchill. She is a coauthor of Sexual Orientation, Gender Identity, and the Law (State Bar of Wisconsin, 2018). Churchill had some difficulty gaining interest in the concept at first because existing LGBT organizations in Madison told her “this concept wasn’t quite the right fit for them,” she says. But after the 2016 election, the need for such legal services came into sharper focus, Churchill says, and legal assistance provider Community Justice Inc. agreed to support the budding organization. Trans Law Help Wisconsin, a pro bono sidelight both to Churchill’s day job as a member of CUNA Mutual’s compliance team and part-time work as a sole practitioner, has about 10 volunteers and has held six clinics with an average of 10-15 attendees each time. The Trans Law Help team also is developing a statewide attorney-referral network, with an eye toward developing resources outside Madison and Milwaukee, as well as a Wisconsin-specific name and gender change guide. The issue of inaccurate documents such as birth certificates, driver’s licenses, and passports can affect transgender people in any number of realms, from obtaining employment, to securing a loan, to providing proof of identity to law enforcement. “I’m doing work that’s helping folks in a really tangible way, and that makes me happy,” Churchill says. Tenants facing eviction, most of whom typically self-represent and lose their cases, now have a better chance of gaining legal help in the Milwaukee and Madison areas. There, the respective local offices of Legal Action of Wisconsin have launched twin Eviction Defense Projects during the past couple of years. The Milwaukee County effort, staffed by project director Raphael Ramos, staff attorney Sofia Ascorbe, and paralegal Don Tolbert, has served 966 clients since early 2017 with help from 73 volunteer attorneys and 25 Marquette University Law School students. The Dane County project, begun in early 2018 and run by attorney Heidi Wegleitner and paralegal Rebeka Pritchett, has served 210 clients with 361 hours from 16 active pro bono attorneys and more than 100 hours of student help. Attorney Maggie Niebler-Brown coordinates the organization’s overall Volunteer Lawyers Project, while Deedee Peterson supervises their development. Ramos says that in 2016, less than 1 percent of the 13,457 tenants targeted with eviction was represented by counsel. In the past 18 months, since the project began, nearly 1,000 such tenants have gained representation, about 70 percent of whom have avoided a judgment of eviction and 15 percent of whom were able to have their records sealed. Ramos notes that the Milwaukee clinic is grateful for the support of Legal Services Corporation, Milwaukee County, the Milwaukee County Circuit Court, the Legal Aid Society of Milwaukee and its dedicated roster of volunteer attorneys and students, as well as key supporters such as Dawn Caldart, pro bono coordinator at Quarles & Brady LLP; Mary Ferwerda, executive director of the Milwaukee Justice Center; Angela Schultz, dean of Marquette Law School; Mike Gonring, former executive director of the Legal Aid Society of Milwaukee; and Amy Wochos, formerly with the Milwaukee County Clerk of Courts. The representation provided is first-come, first-served, and attorneys are assigned the same day to handle brief service for what usually amounts to a single day, Ramos says. When proceedings extend beyond the first day, volunteers can continue with that client or pass them along to whoever is signed up when the trial or next hearing arises, he says. Many landlords and their attorneys gave the project a “cold welcome” at first, Ramos says. “We had to acclimate them to the fact that a group that was previously unrepresented was going to have representation,” he says. “That’s going to slow things down a bit, which is a byproduct of a just system with people asserting their rights.” Over time the process has become more efficient, in part due to increased familiarity with landlords, which Ramos notes has been beneficial to both sides. The Madison project, which operates separately aside from some joint training sessions to teach volunteers the substance of landlord-tenant law, was modeled off the Milwaukee effort but has some differences – funding comes through the city of Madison and the federal Department of Housing and Urban Development, for example, which has meant different reporting requirements. The clinic serves between three and 10 households per week in initial hearings and hopes to be able to represent them at trial by the end of the year, although that ability hasn’t been phased in yet. Instead, they try to refer clients onward or give them the best advice on how to prepare their cases pro se, Wegleitner says. Similar to Milwaukee County, in Dane County about 1 percent of eviction defendants had attorneys, and now it’s between 10 and 20 percent, she says. Entrepreneurs starting companies often focus on their product or service ideas and the funding they need to birth those ideas. But they’re sometimes less aware of careful planning around corporate governance, such as the formation of necessary advisory and governance boards and the completion of proper legal forms. Madison-area attorneys Anne Smith, Eric Englund, and Louis Condon and angel investor and entrepreneur Terry Sivesind founded an organization called Madison Seed Accelerator Inc. (a/k/a Madworks) in 2014, which has since evolved from a traditional seed accelerator to tackle this set of governance challenges, prompted by the need they saw and encouragement from the entrepreneurial community. Madworks has worked with several dozen start-up companies to ensure they build a solid foundation. Program manager Collin Schaefer, who is also an attorney, says the goal of the pro bono program is to build companies that last. To date, Madworks has seeded 85 companies, which by the end of 2017 had a total of 43 full-time and 53 part-time employees who were paid an aggregate salary of $1.35 million. “We bill ourselves as a governance accelerator,” Schaefer says, which breaks down into three parts: board management, solid financials such as bookkeeping, and legal and risk management, the last of which is bolstered through a relationship with the Law & Entrepreneurship Clinic at UW-Madison. The concept began to take seed after the U.W. law clinic realized its clients had challenges that went far beyond the legal realm, Englund says. “We thought we would see if there were a way to provide a broader base of assistance to those early-stage entrepreneurs so they could find resources and next steps,” he says. The program accepts a cohort of companies three times per year for 10 weeks, at the end of which participants receive seed funding from the Wisconsin Economic Development Corp. “We take great pride in being part of the larger ecosystem of resources available to early-stage entrepreneurs,” Englund says, which includes relationships with a variety of other entrepreneurial incubators and consultants. The twin Eviction Defense Projects are not Legal Action of Wisconsin’s only award-winning innovation for 2018. In cooperation with Judicare, the state’s other Legal Services Corporation-funded civil legal aid provider, Legal Action has also established a victim rights project aimed at helping those who have survived crimes, particularly domestic violence and sexual assault. Such cases, where crime victims already face particularly personal invasions, often involve requests to divulge extremely private information. While the Wisconsin Constitution and statutes promise robust rights for victims, those rights generally have not been enforced in the middle of criminal proceedings. To do so requires a third attorney because prosecutors cannot advise the victim and, in fact, sometimes have contrary interests to the victim. The pilot project began in fall 2017 with funding and support from the Wisconsin Department of Justice’s Office of Crime Victim Services, and thanks to a partnership with Wisconsin Judicare the services are available statewide. In addition to Sullivan, the eight-person team includes Legal Action project attorneys Ann Rufo, Becca Donaldson, Kori Ashley, Susan Lund, and Rachel Sattler, as well as attorneys William Baynard and Amanda Rabe and supervising attorney Beth Ann Richlen of Judicare. More than 200 people from nearly half of Wisconsin’s 72 counties have received information, advice, or full legal representation since last December, and 91 cases were open as of mid-September, Sullivan says. Karen Renee often lamented the difficulties in finding certified, qualified court reporters to cover depositions. She has been a court reporter in the Milwaukee area for about a decade and has owned Milwaukee Court Reporters for the past five years. After learning to hail rides using the popular Uber app, she wistfully thought it would be nice to be able to find court reporters as easily. That wistfulness quickly turned to a “lightbulb moment,” Renee says. “Why can’t we find court reporters that easily?” she asked, then hired a web developer to build eCourtReporters.com, which launched in July 2017. The site provides a platform where attorneys and paralegals can choose court reporters and videographers based on their qualifications, certifications, years of experience, pricing, availability, and a Yelp-like five-star rating system from past customers. The search for 2019’s innovation award winners will run from April through June next year. Consider submitting your nominations, whether for yourself or someone else. To learn more, visit ThatsaFineIdea.com. 5 Years of Innovation: Where Are They Now? What have past innovators been up to since being recognized as movers and shakers? We asked some of them to tell us what they’re trying to fix or improve now.